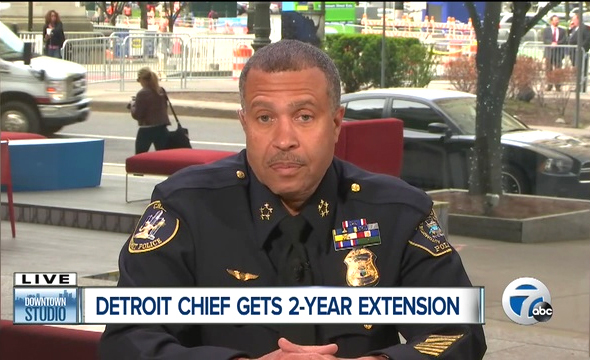 African-American cops in Detroit face discrimination on the job from white superiors and intimidation and retaliation when they complain about it, according to a new report released today by the Detroit Police Department. Chief James Craig (pictured above) portrayed the report as an internal look at the department, not an investigatory document, and said the assessment found no indication of widespread discrimination within the ranks or specific instances of discrimination. The report, released to the Free Press through a Freedom of Information Act request, alleged that in certain units of the department, black officers perceived white officers as getting preferential treatment when it came to training opportunities and advancement, such as appointment to the rank of detective. The report said the alleged discrimination happened in units not staffed through seniority, including task forces on crime analysis and gang intelligence, which it said have been largely segregated and historically dominated by white male officers. A committee convened by Craig, made up of cops of various ranks, visited precincts to speak with officers and compiled a survey of others, according to the report, which was presented to Craig in August. The report was previously considered confidential, but Craig said he released it because one of the two co-chairs of the committee — identified as retired Officer John Bennett and Officer Joseph Weekley — told other media he planned to do so. Bennett discussed the report on WWJ-AM (950). The report singled out white command staffers. At a news conference this afternoon, Craig refuted that finding, saying that most of the complaints were based on “rumor and innuendo,” with no specific allegations emerging from the report.